Property damage: Leaking water can cause immense structural damage to the property by eroding the cement in the walls and foundations, weakening them significantly. Electrical hazards: If the leaking water gets near any electricity lines, it could result in short circuiting, which could not only damage electrical appliances, but also create a fire hazard. Infestations: Leakages lead to the formation of damp zones, which are a haven ready for insect infestations. Health risks: Leakages leading to damp zones can also result in the growth of mold and mildew, which can be a significant health risk, especially to children and asthmatic residents. Appearance: Apart from the smell, leaking pipes can almost instantly drive down the value of a property. Therefore, as you can see, a plumbing problem can lead to several far more expensive problems. Getting the right plumbing contractors, like the experts from Beacon Plumbing can visit your residence and then have your problem fixed in no time without costing you a fortune. Everett’s residential and commercial property owners know that the plumbing in your property is a necessity given the sheer amount of daily processes, which require an efficient plumbing system to be in place. For this reason, residential and commercial property owners need to get the expert plumbing contractors from Beacon Plumbing to make sure that their property gets the care of Everett’s most experienced and skilled technicians who are fully licensed, bonded and completely insured. Our plumbing contractors come armed with the very latest in tools and know how to make sure that your plumbing issues become a thing of the past. Our experts will visit you, understand the exact nature of the problem that you are facing and then use their expertise and tools to accurately pinpoint the problem at hand. They will then offer you a fair and obligation free estimate of the repair / replacement costs involved in fixing the problem. We know that emergencies strike at anytime, but now Everett residential and commercial property owners can relax since Beacon Plumbing’s roster of plumbing contractors is available to help them out with any plumbing issue they are facing in their properties in a completely professional yet cost effective manner. So anytime you have a plumbing crisis, Stop Freakin’… Call Beacon! Nothing beats a relaxing evening after a long day of work to take care of all the stress a workday throws at us. However, Tacoma’s commercial and residential property owners know that emergencies can strike without warning at anytime whatsoever and a plumbing problem can cause your stress levels to shoot through the roof almost instantly. Be it as small as a leaky faucet or as big as a burst sewer line, neglecting a plumbing issue can result in a whole variety of other problems, each of them more expensive than the next. The plumbing contractors from Beacon Plumbing are committed to helping out Tacoma commercial and residential property owners like you in tackling these problems in a way that suits your requirements and restrictions to the letter, be they operational, aesthetic or monetary. Hire one of Tacoma’s most experienced plumbing contractors to do the job; Beacon Plumbing is committed to providing Tacoma’s commercial and residential property owners with the most professional set of plumbing services round – the – clock. Therefore, no matter what time, or which day of the week it is, if you have a plumbing problem, we can fix it for you. Getting the right plumbing contractors to fix your plumbing issues is of utmost need, especially if there is a major plumbing crisis at hand. However, many people are wary of hiring out plumbers because certain contractors often act in a dishonest manner, bringing amateur services to their customers at exorbitant prices. At Beacon Plumbing, we believe in bringing only the most professional set of services that are honest and durable so that once one of Beacon Plumbing’s licensed plumbers fixes a problem in your home, it stays fixed. 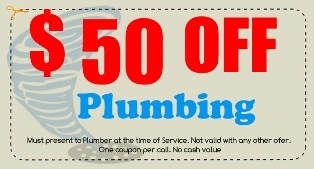 Being an extremely competitive plumbing service provider, we are extremely honest and fair in our pricing. Beacon Plumbing’s teams offer Tacoma commercial and residential property owners the additional benefit of the services of a plumbing contractor who is well versed with all the latest building laws and ordinances related to plumbing. This can help you since our licensed plumbers can recommend the best possible option to fix your plumbing problems, which is in concordance with the local legislature as well. The unpredictability of plumbing issues is often a problem many of Tacoma’s commercial and residential property owners have great difficulty in coming to terms with. At Beacon Plumbing, we promise, a plumbing emergency can strike at anytime, so as local plumbing contractors, likewise the solution will be available at all times too with our services available 24 hours a day, 7 days a week. Give us a call and we’ll send over an expert to look at your plumbing problem and have it fixed in no time. So the next time you’re facing a seemingly insurmountable plumbing disaster, Stop Freakin… Call Beacon! Professional plumbing is a vocation that requires incredible expertise and skills. That is the reason why you need to guarantee that the professional plumbing repair people have respectable levels of skill, or else you might need end up facing more issues. In Seattle, there are many business organizations that offer the services of these handy plumbers. Therefore, it is not difficult to find out about their expertise from other clients. The expert plumbing technicians with Beacon Plumbing bring Seattle’s commercial and residential property owners’ incredible high quality plumbing workmanship to help them with all their plumbing needs. Beacon Plumbing employs some of the very best fully licensed and well experienced plumbers in the Seattle area and takes great pride in making their expertise and services available to you at anytime of the day, any day of the week. We employ plumbers that can handle a multitude of services and can fix whichever plumbing issue you are facing, and can have it corrected right away. They are well qualified and also insured so that you do not need to get stressed over employing them. Using the most recent technology and expertise to guarantee that your work is finished exactly as per your requirements. Beacon Plumbing brings to Seattle both residential and commercial plumbing services. Different services, for example servicing the plumbing in warehouses or even business offices are likewise handled by the expert commerical plumbing experts from Beacon Plumbing. Our commercial plumbing technicians employ the very latest in in-line cameras, which are utilized to pinpoint a problem inside a plumbing system. Using the very latest technology to assist their clients, Beacon Plumbing’s expert plumbing technicians can help Seattle’s commercial and residential property owners in steering clear of any unnecessarily expensive repair operations. Therefore, Seattle’s commercial and residential property owners need no longer worrying. With Beacon Plumbing, they can now enjoy the most cost – effective and high quality plumbing services from some of Seattle’s most experienced plumbing contractors. Give us a call or visit our website if you feel there is a particular plumbing issue that needs immediate professional attention. Just remember, no matter how big or complex the plumbing problem might seem, Stop Freakin’…Call Beacon! Not unlike the blood that streams through all the arteries, veins and capillaries in the body, the plumbing system of any property makes sure that water also runs persistently through all the various pipelines of any private or commercial property. This set of maintenance activities is best undertaken by some of Seattle’s finest commercial plumbing technicians, like the one’s working for Beacon Plumbing, whose training and experience in fixing pipeline issues in different types of structures, be they residential or commercial. A fully licensed and well-experienced team of commercial plumbing technician from Beacon Plumbing understands the impact a crises, especially one related to plumbing can affect the business organizations in a detrimental manner. Our team of experts will examine the business’ premises thoroughly, pinpoint the origin of the problem, and fix it quickly with complete professionalism. Our plumbing technicians are specialists who have endured years of rigorous training and have got the technology, know how and the finesse to fix any plumbing issue as rapidly as possible, giving Seattle’s residential and commercial property owners the benefits of an expert and high quality service. The objective of Beacon Plumbing’s plumbing technician is not a simple one since preparing the adequate solution for each unique problem requires a large amount of planning of the entire operation. Any deficiency in planning will lead to significant and expensive problems in the future. From planning the fittings of your faucets to the brand new water fountain in the atrium of the building, each plumbing operation needs the accuracy and expertise of the plumbing technician. Beacon Plumbing’s plumbing technicians understand the losses that any disruption in daily business processes can entail, let alone the ripping up the flooring to access the plumbing infrastructure underneath. Amateur plumbers might recommend such actions but we know that will only end up stopping your business for days while they struggle to get the job done. We at Beacon Plumbing on the other hand, employ non-invasive commercial plumbing repairs, restricting the damage to a small hole or two in the floor, while your business carries on as usual. Therefore, as you can see, getting the right plumbing technician from Beacon Plumbing is the best bet for you to fix any plumbing problem on your property. Therefore, the next time your business faces a plumbing disaster, which threatens to disrupt operations, Stop Freakin…Call Beacon! Owning your own home comes with its own share of benefits. However, the caveat lies in the fact that this means you have to take care of it constantly as well. Of course, you could attempt to handle everything on your own, yet that might wind up taking a toll on you in the form of a ton of cash and time in the end. Not just that, imagine a scenario in which your capabilities are over-matched by the problem at hand. The chances of derailing what could have been a smooth operation is very high when you are managing numerous issues, which require expert experience. That is the reason it is imperative to call a plumbing contractor like Beacon Plumbing and in the off chance that some problem lays beyond your ability. Even if you are on a tight budget, you will discover that there are a couple of rather major benefits of having an expert plumbing technician come in and take care of any problem. With the expert help from Beacon Plumbing’s plumbing technicians, you can enjoy a wide variety of benefits. Regardless of the fact that you are usually as happy as a clam, a crisis can effectively take away that happiness inside less than a second. Many residential property owners have no issues, but then out of nowhere one of the pipes in their basement bursts, turning it into an underwater cavern. By calling the expert plumbing technicians from Beacon Plumbing to help you out, Bellevue residential property owners like yourself can guarantee that you will not have to spend a fortune on your misfortune and have that peace of mind that can keep you sane and calm when some problem like this goes off. Another factor to consider when thinking about the benefits of having an expert plumbing technician from Beacon Plumbing help you in and around the home, is that you will have the opportunity to upgrade or install new plumbing appliances with expert assistance. Improper or amateur installation of the same can end up backfiring in a big way and may cause a great deal of anxiety in the process. To evade all such issues, bring in one of Beacon Plumbing’s expert plumbing technicians to finish the problem the right way, on the first run through. Deciding to Hire a Local Bellevue Plumbing Contractor? So feel free to give the plumbing technicians at Beacon Plumbing a call, or visit our website and we’ll make sure your plumbing problems are a thing of the past. No matter how big or complex the problem might seem, all Bellevue’s residential property owners need to do is Stop Freakin’… Call Beacon! For Seattle’s residential property owners, Beacon Plumbing’s plumbing technicians deliver an imperative set of services, given their mastery in making sure that the plumbing framework of the property is up and running at optimal efficiency. For practically every residential property owner in Seattle, there will be a certain time when they will require the assistance of an expert residential plumber. The expert plumbing technicians from Beacon Plumbing offer an extensive variety of plumbing services which guarantee that Seattle’s residential property owners uphold and augment their plumbing framework and consequently their property’s value in an extremely cost efficient manner. Plumbing Pipes: The expert plumbing technicians at Beacon Plumbing know that the modern plumbing system comprises of an extensive system of pipes and fittings that run throughout the property. There might be some issues with this system which crop up now and again requiring the skills of an expert plumber. Eroded, damaged, and burst pipes should be repaired or replaced by an expert plumber. 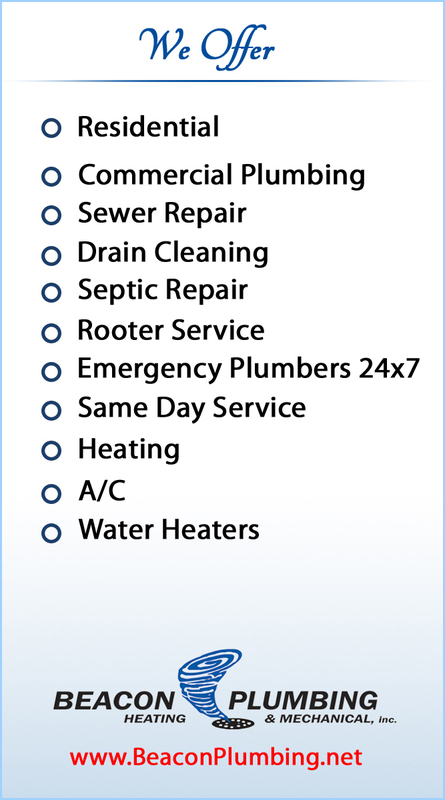 Drain Services: Within the plumbing system, a number of contingencies could develop. For example, piping can corrode over time, blockages can also form in pipes with a smaller diameter, and there could be the aggregation of hard residue accelerating the stoppages in the pipelines. Expert plumbing technicians from Beacon Plumbing have all the latest instruments, know how and the supplies to clear up any blockages and clean the affected pipelines. Septic System: Like any other system, problems can also develop within the septic system installed in a house. A septic tank can get blocked up, causing a sewer line to back up in the property or the drain field. Beacon Plumbing’s sewer technician can fix the clogs or pumps that these malfunctioning septic tanks have to guarantee that the septic tank is not getting blocked anymore. Likewise, they can help you in finding out and removing any septic repairs as well. Emergency Services: In all of our experience in bringing our services to Seattle residential property owners, one thing we know is the devastating impact a plumbing emergency can have on the homeowner’s stress levels. No one wants to wake up in the middle of the night to find out that his or her basement is turning into a swimming hole. Since emergencies can strike at anytime, we at Beacon Plumbing bring the assistance of our plumbing technicians to you round – the – clock as well. So give your Seattle home the quality of plumbing services it deserves with Beacon Plumbing’s highly acclaimed plumbing technicians. Get in touch with us by call or visit our website and we will make sure that all your plumbing issues are fixed. So no matter how big the problem, Stop Freakin…Call Beacon! If your existing boiler is making random creaks, groans and hisses or if your heating bills are going through the roof, then it may be an indicator that your boiler is not working proficiently and may need to be swapped out or upgraded. For helping our Seattle customers out, Beacon Plumbing offers its set of boiler related services. With the assistance of our expert boiler specialists, getting these services means a solid, dependable and practical repair and installation experience. In spite of the fact that there is no predictable timing for a breakdown, in any case, the onset of summers is the generally recommendable time for buying and installing or repairing boiler systems since the possibility of any disappointments or system breakdowns are much lower. Because of this, the specialists from Beacon Plumbing have sufficient time to make sure that you receive a set of services that really helps get the ball rolling again. The biggest advantage of getting your boiler repaired in the summertime is that it is extremely cost-effective as well, since little time is wasted in preparing for and facing adverse weather conditions. Getting the right people to help with installing or replacing the boiler on your Seattle property is not exactly a one – man, do – it – yourself operation. At Beacon Plumbing, our team of experts knows exactly the amount of physical and mental effort required for the same, given their experience in bringing our premium boiler repair services to our existing Seattle clientele. Given all the training and experience the plumbing experts from Beacon Plumbing have, it is pretty clear why they are the best at delivering the most acclaimed boiler repair services to their Seattle customers. Our experts are not only trained and experienced, but also fully insured, bonded and certified to bring these services to Seattle’s commercial and residential property owners. Therefore, in case the boiler in your home is causing your stress levels to boil over, Stop Freakin’…Call Beacon! The plumbing system of your home is responsible for providing constant supply of clean water and to keep it working efficiently you should pay attention to its regular maintenance. With time, leaks and other issues can arise in the system, causing inconvenience, which can be easily avoided by hiring the services of a professional plumbing company. We understand the value of your investment that you have made in getting the best quality pipes and faucets. However, unforeseen issues like leaks and pipe bursts can lead to unwanted expenses, lowering the value of your property as well in the long run. Beacon Plumbing is a renowned plumbing company in the Federal Way area that has been serving the residents since 1999. Our prompt and efficient services are the reason why we are so renowned among residents, who trust us to provide effective solutions for all their plumbing needs. The team of professional plumbers at Beacon Plumbing is well aware of the problems which can occur in your plumbing system and are always ready to provide you most credible solutions. No matter how big or small the issue is you can rest assured that it will be sorted out in the least possible time by our plumber. If you are facing any problem with your plumbing system or even as a preventive measure, it is advisable to keep the contact information of a renowned plumber near you. It will not only save you from any unwanted convenience, but will also ensure that help will be at hand whenever you need. For the residents of Federal Way, who are looking for a reliable plumbing company, Beacon Plumbing has just the right solutions. A proficient team of plumbers is always there to help you get rid of any issues that might be giving you sleepless nights. Rather than just concentrating on the current issue, we pay attention to find the underlying cause of the problem, in order to eliminate any chances of it recurring later and causing any inconvenience to you. We make sure to keep upgrading our knowledge and practices, to stay in tune with the advancements taking place in the plumbing world and provide you the most effective and long lasting plumbing solutions. Stop Freakin…Call Beacon! A well functioning furnace system ensures that the atmosphere in your home stays relaxing and comfortable always. A heating system that breaks down or stops working in the middle of the night is definitely a nightmare that nobody would like experience. Thus you can avoid this scenario by taking a step right now and hire the finest furnace repair services in Bonney Lake. When looking for furnace repair and maintenance services, you would definitely want a company which can provide timely service at reasonable price, at whatever time you need. Beacon Plumbing offers you all that and more. Our efficient and skillful technicians are equipped with thorough knowledge and advanced equipments to serve all your needs in an efficient manner. Whether it is in middle of the day or night, we will be right there whenever you need our services. Lack of maintenance and repair of furnaces can augment even the small issues over time and it is not hard to imagine the inconvenience it can cause to you and your family. Thus make sure to get it checked regularly, so that it will not stop working when you need it the most. Rather than waiting for a problem to occur, you should hire furnace repair and maintenance services which will never let you face any inconvenience. Beacon Plumbing offers both regular maintenance and emergency heating services so that you can rest assured that your furnaces are working efficiently. Whether you wish to get the heating system of your home in Bonney Lake repaired or install a new one, you can completely rely on the efficient team of Beacon Plumbing to offer you the most sensible advice. Beacon Plumbing is a leading name when it comes to providing long lasting solutions and timely services for regular and emergency heating repairs in Bonney Lake. Our company is family ran with dedication and passion for serving the residents of Bonney Lake and providing them incomparable and timely services always. We aim to deliver the best quality furnace repair and maintenance services as per your needs and budget. We employ people who have a passion for their work and can deliver the promised services. Give us a call and we will assure to make it a convenient and hassle free experience for you. Water heaters are an imperative need of every household. It is hard to imagine a life without a water heater as it is the only medium to provide you constant supply of hot water in your bathroom and kitchen. As our dependence on water heaters increases, owing to their beneficial qualities, it is advised to invest in a good quality new water heater that will keep serving your needs for a long time. With a variety of water heaters being offered in Auburn, in various styles and price range, making the right choice can be tough. Thus, for the most credible advice you can trust the professionals at Beacon Plumbing. Water heaters either run on gas or electricity. It requires precise knowledge and tools to ensure that the new water heater is installed properly. Our team at Beacon Plumbing provides fast same day service in the Auburn, WA area and we are well versed with the installation and maintenance process of new water heater and can provide the most efficient services. Whether you have installed Gas & Electric Water Heater in your Auburn residence, it is imperative to pay attention to its regular repair to avoid any inconvenience. Even if you have invested in the best quality new water heater, with time and constant use, it might lose its efficiency. On top of that, ignoring the need for regular maintenance can further degrade its condition and it might break down anytime. Thus, it will not be wise overlook the need for regular repairs and maintenance. If you wish to keep enjoying the services of your new water heater for a long time, then make sure you hire services for its regular maintenance. At Beacon Plumbing we realize the importance that a water heater holds in every household and we also understand the inconvenience it can lead to in case of breakdown. Thus we strive to offer our clients in and around Auburn timely services for the installation and maintenance of water heaters. Water leaks, insufficient water supply, high utility bills and not sufficient hot water are some of the issues that can occur due to a faulty Gas & Electric Water Heater. Our technicians will first analyze the entire system, before suggesting the most effective solution to get rid of the existing problem and avoid it from recurring as well. Stop Freakin…Call Beacon!